Having worked with lots of adolescents I developed some techniques for getting to that hidden information so I could help. The best tool is some form of art. You don’t have to have artistic skills, because it’s the content and process that matters. I find that you can pull together a cohesive picture of your passions, hopes, dreams, and your focus if you simply allow yourself to respond to the material. I use magazines and a simple collage technique. 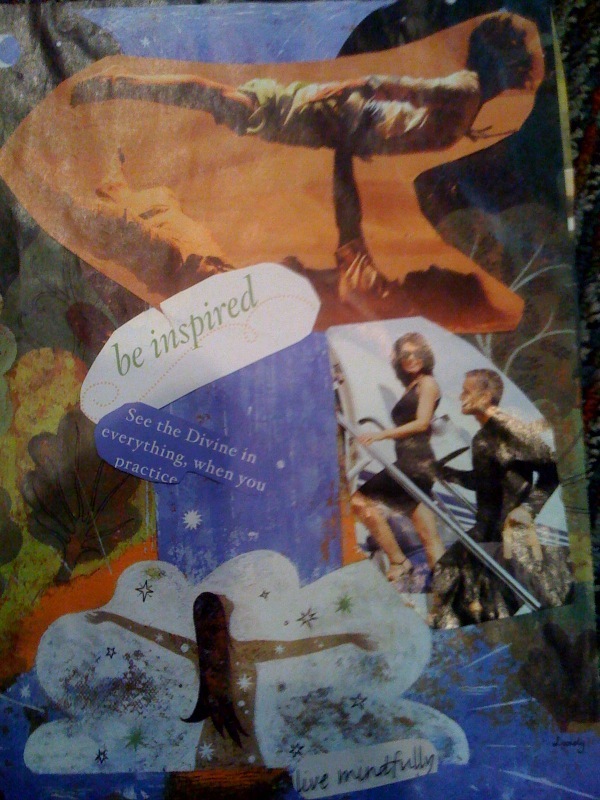 Choosing which pictures that attract you and then arranging them in a way on the paper, that is pleasing to you, can allow you to create a snapshot of what is going on in your unconscious and to what you are attending. If you put intent into the picture then you can also create a tool that allows you to be reminded of your goals and current focus. It’s like a pictorial affirmation or mantra that you can look at and incorporate into your daily actions. Place the collage in a space where you can view it easily and be reminded by its images. In this one I have used a background onto which I have placed various images – this is an example of an intentional blueprint. When you are simply working with your unconscious you may find you are attracted to many disparate images and then you can use the piece of paper as the structure onto which you place the images together in a pleasing manner. In this second kind of collage you will find that it is slightly less consolidated but still feels complete. You may not know why an image is attractive but if it is, cut it out. Once you have all the pieces then place them on the page so they fit in some way. You may cover aspects of the images and find that only a slight amount of an image is in the finished product. Try to let yourself be guided by an intuitive and meditative process while incorporating all the images that seem to go together. Once you feel finished, glue the pieces together onto the page. Sit back and view what you have done and see if you cannot identify different issues that you are dealing with on an internal level. It’s a lot of fun and if you allow yourself to be relaxed you can access parts of your unconscious that are sometimes hidden. Then place the collage in a place where you will view it often and automatically, like a refrigerator door, a bathroom mirror, above your kitchen sink, your work desk, or a closet dresser. Each time you look at it stop and breath in the different images and be with the collage for a few seconds. This allows your right brain to continue to work with the images to guide your actions. I have used this also in my own personal development. Many years ago before I even considered going back to school for my Oriental Medicine degree, I found that I kept being attracted to statues of the buddha and lotus flowers and various chinese and eastern tradition symbols – I kept putting these into my collage not with any intent, simply because I was attracted to them. Within a year of this, I awoke one morning with a strong pull to go to get an Acupuncture and Oriental Medicine degree. I had been developing my concept of the connection of spirit, mind, and body and felt that I needed another education degree to develop my understanding and my skills in integrating this. Could that have been my unconscious speaking to me about this through the collages – I think yes. I hope you get the opportunity to create some space in your day to play with this and see what information your unconscious has for you that will guide you to your new world. Myths are stories that hold a sense of truth and history in them and provide an explanation of a world-view of a group of people. These may include parables or moral stories about how to act in the world. Wisdom is that information, accumulated knowledge, or enlightenment that gives us insight, strength and assistance in moving through difficult decisions and adversity. Seeing through false myths – whose information is not true, or wise, is part and parcel to the work in parenting and our own psychosocial development. Challenging the myths that are second nature to you, that you have swallowed whole from your own childhood or upbringing is the hardest part of adulthood. These are often wrapped in little phrases that you say absent-mindedly. Here is an example: No good deed goes unpunished. The myth is that if you do something kind then you will pay a price for your kindness. How do you think this came to be and what is it trying to teach? Does this result in a person feeling more connected to a group or separate from one and which is more useful? Myths and wisdom provide us with tools to help us navigate life effectively and with a sense of strength. But they also have a sociological connection. You see this with how people view political parties. Myth can be see as fact rather than a story, just like prejudice – pre-judging. There is an element of prejudice in each action we take. For those of us who strive to live our lives without prejudice this is a difficult thing to accept. Many years ago, in an art support group, I heard a fellow colleague discuss this. I was astonished by the concept – I am not prejudiced – look at the array of friends I have from different races, countries, religious backgrounds – I am not prejudiced I reacted vehemently – she calmly responded that we all are – we have to be to make decisions in the world. The work is not to relieve your self of every prejudice – it is to understand and own those you have, so that you can mindfully make a choice about how you want to be in the here and now, in each present, unique situation. It took me years to understand her point, years of maturing and practicing mindfulness; years of accepting real responsibility for my choices, actions and beliefs; years of focusing my energy on acting in a congruent way in the world. She is an extraordinary woman – she knew this 25 years ago as a young person, many do not understand themselves even now and so act in abhorrent ways while calling themselves righteous. Acting congruently means that if you want the world to be tolerant you cannot respond to intolerance with hate – Being congruent is acting in ways that are consistent with what you espouse as your beliefs. Understanding the wisdom that is held in the myths we hold true is a dynamic and ongoing process. The more we can listen to the words we use, and act in a congruent way, the more we can act in a way that uses the wisdom of our myths. The Chinese philosophical text the Tao Te Ching, attributed to Lao-tzu, has extraordinary passages about mindfulness (and emptying the mind). Te meaning Virtue, and Tao meaning the Way. These texts were found with one of the earliest forms of the I Ching, The Book of Changes and are written in a similar style. For me, I find these texts helpful to elucidate the need to be in the middle – in one’s center – seeing both figure and ground, diminishing the need to control or push the river, and increasing the philosophy that going with the flow while remaining connected to virtue and one’s center, is of the utmost importance in creating success in life – the Way – or what I call The Path to Grace. To not lose your place is to last long. To die but not forgotten – that’s true long life. I think of standing in the middle of the river, fly-fishing, the water as it rushes by me drowns out all other sound so that it is like a deep and true silence; the water ripple ahead looks like white birds flying off the water. It is a moment of now. Me in my center, the world around me without meaning. I experience the deafening sound of the water as the beauty of the white water transforms me into a middle place where two pictures of the world can be seen simultaneously: the water flowing by me and over the rocks in white rapids and the vision of the white birds flying off the water toward the sky. I feel my heart pounding in my chest, my breathing, and a true sense of peace. This is the picture of a meditative state for me, where true clarity is at my mind’s fingertips and I am in complete connection with spirit, nature, and my authentic self. In that moment I notice that I am in joy and that my natural state is joy. Being in one’s center allows a peaceful joy to take center stage and all decisions and actions from that place are in one’s best interest. May you find your picture of being in your center so that you may access it easily, and completely – at will – so that joy is ever-present in your daily going and coming. Ever used a compass? It’s really cool! No matter where you are you can open a compass and see where north is. It gives you a focus and a center so that you have information to help you decide where you are going and where you want to go. Early in my practice I used to give out a compass to individuals who were graduating from therapy. The best lesson to gain from therapy is to have a sense of who you are, what has happened to you, what that means, and where you want to go. It gives you the tools to find your way in the world. It develops your internal compass. I think an important part of parenting is to develop within your child an internal moral compass. A sensing system that assists an individual in determining where he is and where he wants to go, and how to get there. An internal moral compass evolves out of one’s value system and character. It’s markers are through one’s senses, intuition, and mindfulness. It’s the aspect within yourself that guides you in making decisions about your actions. It helps to define not to steal or cheat, but also it’s the aspect in you that says don’t say that mean thing just because you can – don’t be a bully, be strong through your internal sense of self rather than through pushing another around. It’s the aspect that guides you to do your heart’s desire rather than the thing that might fit another’s picture of you but pulls you away from yourself. We develop our intelligence and our picture of how to be in the world through observation and experience, mostly. That means for the most part our children’s connection to values and character come from how we act, behave, and communicate in, and about, the world. If we say have character but we don’t actually act with character our children will learn to speak one way and behave another. We will not be passing on a sense of security and confidence but rather a dissonant insecurity. What matters is what we do when we are in a conflict, challenged or faced with a dilemma. If our actions are not congruent with what we have been trying to teach verbally our children will incorporate the action as a way of being in the world. This means it is important to be present and act mindfully in your everyday life. If you say don’t use curse words then of course don’t use them yourself. If you say have patience then of course have patience with your child. If you say have perseverance and don’t give up – then of course that is how you need to behave yourself. If you say don’t react to your friend’s mean statements on the playground have compassion or remove yourself from the situation then that’s what we have to do with our bosses, and colleagues, and friends too. Children and adolescents are watching all the time, even when it looks like they are engaged in their books, TV, and music… they’re watching, observing, taking notes, and incorporating our behavior into theirs. If we drink alcohol excessively, use drugs, deny our issues, and check-out on life, lose our temper over minor things – even if we think we have good reason to do so – they will develop those behaviors. It’s embedded in our DNA to learn in this way. They also learn from our change in behavior and our owning up to how we make mistakes. So, if we do all of the above and then realize that wasn’t okay, talk about it, and change – really change – that gets incorporated too. Sometimes it takes time for the new data to get incorporated but if we remain consistent in the change then it will have a positive effect. Developing a moral compass comes from using the everyday experiences in life to show the best way to be in the world. Choosing compassion over reactive anger, patience over reactive frustration, passion over apathy, belief over denial and fear, tenacity and confidence over insecurity. It’s mindfulness, and paradigm shifting, and being balanced in our responses by incorporating a fluency with figure and ground. I came from a family where perfectionism was highly rated. The problem with this is that it is also somewhat impossible to attain, the result for me was a number of positive character traits and one negative one. Over time I had to learn that perfectionism while great as a goal, was not always feasible and when not met I had to develop a sense of realistic compassion toward myself. It took me a long time to see that while not perfect I was strong, tenacious, ambitious, talented, and inventive, and that more than anything my anxiety about wanting to do it perfectly the first time was more debilitating than anything else. I had to learn that in some situations I simply could not control the outcome because events would occur that would interfere with my success. I have had to develop a mindful, loving, and neutral approach to obstacles and a compassionate connection to my self. Recently, I found myself having to deal with these issues in a very stressful situation with my beloved daughter observing. I was astounded at the immediacy in how she incorporated what she observed. I was at the end of writing a seminar that I was going to have to facilitate in two days hence. I had been working steadily for 5 hours and had written over 50 slides. I had been saving in my program and was just about to do a save as when the computer did a glitch and all the work was lost. I didn’t panic I went to find what had been saved but all I could find was the first 19 or so of the total 65. It was my first time working in the program and hadn’t realized that it required a save as for a permanent save. All my work for the last 5 hours was gone. The slides were due the next morning. I could feel the anger and frustration rising in my being but I realized this reaction would not really benefit me and I made a choice to just begin again. I calmly went back to the beginning and began to re-write the slides. I worked steadily using the save as, and five hours later had a great product. A few weeks later my daughter was working on her computer making a card for her friend Jessie. She put a great deal of effort into the card creating special drawings and additions through her computer drafting. When she was ready to print she hit the wrong key and the picture was lost. Now my daughter is somewhat sensitive and gets frustrated when things do not work out as she had planned. But to my amazement, instead of throwing a tantrum, or getting upset I watched her as she calmly went into her room and picked up a piece of paper to re-start her card for her friend. I asked her if she was disappointed about losing her work and she said. Yes, but I remembered your slides and what you did so I’m just going to start over, because I don’t have much time and I really want to give this to Jessie. We really are models for them about how to live in the world. We can help them to thrive or we can help them to feel insecure. We can offer them the skill of patience or reactive action. Developing our own moral compass and helping them to develop theirs is an important task in parenting. It isn’t perfect, because children come in with their own personal styles of being in the world, their own temperaments, but what we do, our actions and behavior, can either help to extinguish negative aspects or increase positive aspects of their temperament. Developing your mindfulness and balance in the world will help you to develop your, and your child’s, moral compass. So that you, each, can feel you always have a sense of which way is north and which way you want to go on your path. Mindfulness and congruence are the keys. The word Mantra refers to sacred words or syllables used repetitively in Vedic religious and ceremonial rituals. Mantra is a religious or mystical syllable or phrase, typically from the Sanskrit language. Historically, Mantras are used as spiritual conduits, words or vibrations that inculcate concentration in the devotee. Mantras are also integrated in religious rituals to remove obstacles, avoid danger, or accumulate wealth. Mantras got their origin from the Vedas of India. The word Mantra is derived from Sanskrit: Mantra contains two words – man which means to think (or mind) and tra which means tool, – instrument of thought. I have also heard this interpreted as mind, and to deliver – to deliver the mind. I think of it as a focusing tool that clears away obstacles and centers a person into their true (authentic) self. The frequent repetition of a meaningful, spiritually coded word can serve as a stress management tool. Studies have indicated that the use of mantras can induce relaxation. The key is the meaningful, spiritually coding part. In other words repetition of negative belief systems will increase stress related signs and symptoms, while repetition of positive phrases can decrease these signs and symptoms and create a space for the individual to focus their activity constructively. Any prayer or phrase from a spiritual or religious text that has meaning for you can produce these results. Mantras are energy-based sounds. The Indian metaphysical tradition explains that the body is composed of the combination of five elements and the first of them is sound. I was trained in the use of sound from a Shinto (Japanese spirituality) perspective and have found that toning is one of the most effective and efficient methodologies in healing. I am certain this is why singing and music can bring about a profound change in one’s attitude. Studies in sound symbolism suggest that vocal sounds have meaning whether we are aware of it or not. One’s subconscious mind can find its solution through meditation and recitation of mantras. A mantra, when repeated constantly during meditation, first loudly and then through silent and mental chanting, changes one’s consciousness. Other studies have shown that the use of a word or set of words can increase resilience and persistence in athletic endeavors. This is also useful when dealing with challenging situations where you feel you have no power to change the situation at present but need to maintain a positive attitude. And it can be utilized in academic endeavors as well to produce a refined focus and tenacity. My first experience with this concept was de novo while practicing my ice skating jumps. I naturally began to think a word to myself over and over to focus myself on an easy landing. Release and smile. I could see myself landing strong and then releasing my body into the famous arch and smile, arms gracefully yet firmly holding the pose before moving onto my next assignment in the routine. While facing black diamond ski runs that made my heart race with fear I would repeat gravity is my friend, as I felt my body tuck into the familiar swish and turn racing down the bumps and trying to let go of my need to think about the turns rather allowing the mountain to move me effortlessly. Pushing through my difficult breathing struggles while running I hear the words I breathe easily, and trust the process. Each gets me a little further before I feel my lungs shut down and I have to stop. In the 80s and 90s people would refer to getting in the zone. From my experience a mantra can get a person into a neutral place available for paradigm shifting. It creates the opportunity for a mini-paradigm shift. Rather than feeling the emotion or attitude that can block success or progress one has a clearing and a space to shift their thinking. It creates internal space for thinking clearly and mindfully, to gather one’s forces toward an end rather than thinking habitually and reactively which will diffuse one’s strength and focus. If you are faced with adversity that requires internal fortitude and strength use a mantra to help you get an attitude adjustment. Let go, trust the universe. You feel frustrated and overwhelmed: everyone is doing the best they can. If it’s about a project deadline: I can do it – focus and breathe. You feel insecure, unsure of your relationships: I am lovable. Beginning to feel a loss of control or loss of temper: Breathe. Love. Allow others to be. I don’t have to respond right now. The trick to finding the right mantra is to find the word that produces relaxation and focus at the same time – the phrase that speaks to the unreasonable expectation or the fear and releases its hold on you. As you focus on this you will find you get more efficient at choosing effective words and phrases. It is actually quite fun. I find this is a very effective tool for moving through difficult circumstances and quite manageable for children to develop an inner sense of peace and strength. Meeting basic physical needs is paramount to a mindful attitude in life. In my Book, 8 Habits to change your life, I write about creating habits that support health and well-being. The basic requirements of food, water, exercise, breath, and sleep are predominant for wellness. When an individual lives in a balanced way with respect to these requirements he or she has a great capacity to tolerate and defend against the negative effects of stress. Often, sleep is the one aspect that seems to be discarded quickly without a thought to the negative effects of not maintaining good sleep habits. Sleep is this great regenerative process built right into our genetic structure. Sleep is helpful to spirit, mind, and body. It transforms moody, difficult emotions into sweetness and stabilization. It takes muddled thinking and creates clarity. It takes tension and pain and creates smooth movement and pain reduction. It works more efficiently than medication without side effect, yet it is the first thing that we discard when we are stressed physically, emotionally, or spiritually. When we need it most we are most likely to deny ourselves sleep. Often one does this due to really good reasons – but not if you understand the amazing, positive, healing, and maintenance aspects to sleep – then we would see we’re better off getting a bad grade or re-negotiating a deadline than missing out on sleep. Sleep plays an important role in learning and memory consolidation. In fact, sleep deprivation can result in memory loss and diminished fine motor and cognitive skills, impede response time in crisis situations and increase psycho-emotional problems. Lack of sleep can actually create pain, and is a major contributor to pain syndromes such as chronic fatigue syndrome and fibromyalgia. For children who are six years old and younger it is important to get about 10 – 12 hours of sleep, at least, more for babies and toddlers. There is a direct correlation between lack of sleep and an increase in oppositional and aggressive behavior. Children who have a long period of sleep deprivation also have more anxiety and depression complaints. There seems to be a vicious cycle in sleep loss: lack of sleep leads to anxiety and difficulty falling asleep which leads to less sleep. A cue to the fact that your child is not getting enough sleep may be a lack of listening, spaciness, oppositionality, complaints about physical and emotional issues, and whining, especially if these are not typical behaviors for your child. Children with sleep issues have difficulty with transitions and an increase in separation anxiety as well as difficulty creating an inner sense of structure. Making sleep a cornerstone focus in your overall health plan is an important component for emotional and cognitive development, resilience, health, stress reduction, and success. I think of it as making sleep your friend or creating space for sleep to happen on its own. There are a number of things you can do to create useful and effective sleep habits. First, make sure you try to go to sleep and wake up at the same time every day. Turns out it’s not that great to short yourself sleep all week and then sleep in on the weekend. We have something like a sleep bank so if you withdraw all week-long you will still owe even if you have a good long sleep one day on the weekend (or even both!). An adult should get 7-9 hours of sleep a day; school age children about 9-10 hours, although some need twelve hours though elementary school. Chinese Medical theory identifies an important cycle that suggests getting to sleep by 11 pm; this is also supported by evidence in Western Medical theory. Next, drink several liters of water a day, that’s right about three liters. Water is essential for cellular health – so being dehydrated causes headache, listlessness, dizziness, and believe it or not can affect your cognitive skills and cause pain and insomnia. Next, breath. Focus on meditation, yoga and exercise to keep your mind, muscles, and spirits integrated and working well. Creating mini – meditation or breathing sessions into your day: waiting on line at the supermarket, stuck at a traffic light or while waiting on the phone at work – all will help to keep you balanced and less tense. Also essential for cellular and blood health. Try to exercise at least 30 minutes a day or 5 – 6 hours a week. Drink less alcohol and less caffeine (bummer I know). Don’t smoke, anything. And make sure you get enough protein from different sources, not just meat. When you are dealing with a bout of insomnia try to stay calm. Breathe. Use the time to meditate, read, paint, knit, draw, or some other calming activity. You may want to try yoga but avoid other types of exercise like push-ups or the treadmill. Avoid TV and the computer just before bed (turn off at least 45 minutes before sleep). TV and the computer have lights that excite aspects of your brain so that it is harder to allow yourself to sleep. And try to keep your bed solely for sleeping. It keeps your mind on track that if you’re in bed it’s time to sleep. If you have no allergic issues, the use of calming teas like licorice, chamomile, and lavender are great to bring down your heart-rate and get you in the mood for rest. As are their counterparts in essential oils for smelling purposes. Eucalyptus and rosemary oils are useful if you are feeling the beginning of a cold, or some sort of illness. Rose-geranium, clove, cypress, and tangerine oils are all helpful for over-thinking, fear, anger or obsessive thoughts that are keeping you awake. Choose one to which you are attracted. For children, lavender, chamomile and rose are soothing and bring a sense of comfort at bedtime. Create a comfortable routine for sleep that includes a step-down in activity that begins one to two hours before sleep. This is similar to what we do with our children and their bedtime routine. Whatever you do, try to maintain a sense of structure without making it rigid because that increases anxiety and stress and detracts from the relaxing component. Give yourself the benefit of sleep. Rearrange your life so that sleep is higher on the to-do list. You may find that making that change creates a ripple effect in altering your habits to increase your sense of balance in your life, and increases your success and effectiveness at home, work, and in your relationships. I think this goes to the heart of what interferes with success. There’s a lot of focus on doing what is expected, a tendency of avoiding being different or avoiding failure. I think this limits a person. It keeps them smaller than they really are. A sociologist or anthropologist might say it’s part of the social mores to keep the group in-line. This may be true; there needs to be some rule and order in social groups but as with many things too much can create a problem. Maintaining a group sense is good to a point. If we don’t make room for unique responses to problems then we don’t allow for creativity, ingenuity, and invention. Some of the best lessons and most rewarding gifts come from mistakes or failures. I’m not advocating trying to fail but rather a view of seeing what the lesson of the failure is so that the next step will be a beautiful success. Any successful businessperson will tell you they had some big failures before they hit it big, It’s not just part of the mythology of success it’s a part of the way we develop. I see this avoidance of vulnerability in relationship too. It may be how the divorce rate could be interpreted. A lack of honesty in relationship leads to being in a relationship that is unhappy and unfulfilling. In my work with couples I encourage them to make sure their real self is in the relationship. Because then when they feel love they can feel it to their core. We want to be loved. So we try to be what we think the other wants. The problem with that strategy is that when we succeed in being loved it’s not us, it’s a less real us that is loved. For some they can spend the rest of the relationship trying to get their full self into the relationship, renegotiating their agreements and their core ideals. This can work when both parties are able to tolerate vulnerability. The payoff is big if you risk vulnerability and win; but the cost can be dear if you lose. When we express what we really want and it doesn’t occur it seems to hurt more than if we don’t actually try to create what we want. In the latter case the loss is more the loss of a possibility. Spending a lot of time and energy avoiding risky situations because we want a sure thing can be a smart strategy. But it can backfire – forcing us into lives where we don’t have passion, or ambition, or feel alive. I think it forces us to live a life that isn’t ours, not the one we were born to live. And then there is the concept of risking vulnerability or being seen more on a spiritual level. This is an aspect of being or doing that to which we are drawn but feel it isn’t smart, or responsible, or practical. This is the area in which we have talent but it may pull on us spiritually in a way that connects directly to our core. Think about how to bring in more of the aspect in which you feel most vulnerable but you feel you lack skills – it’s probably the area that will ultimately bring you the most joy or success because it’s probably the area you felt you needed to keep under wraps because it meant so much to you. When I was 25 years old, I felt I had to make a choice between my artistic creations and my art/work of therapy. The former felt a part of me, a deep aspect that defined me in an undeniable way. The latter also felt connected to me but it had a more cognitive and external aspect that identified how well I could interact in the world. The former I viewed as a talent the latter a skill – or rather a refined talent. Although I had a great deal of my heart in my therapy, it was distanced from my central self – it was something I did – a doing; my artwork was all heart and directly connected to my core – it was more of a being – something I was. At 25 years old, I chose to make my profession the therapy because of its distance from my heart and my sense of vulnerability there, but I wonder if I had chosen my art/writing if I would have found a deeper, more profound joy and satisfaction in my living. My psychotherapy and integrative medicine practice has been that with which I negotiate the world. The distance has allowed me to feel less vulnerable. And I have found a modicum of success in that venture. In this last year I have allowed my self to re-incorporate my artistic and writing adventures into the whole of who I am. Risking vulnerability by writing. In doing this I have felt an expansion in my personal being. Incorporating both my therapeutic skills and my artistic talents to provide a wholistic approach to health and well-being that can positively affect a greater audience of people than those whom show up at my practice door. May you find amazing ways to integrate that which you love and that in which you are skilled, and discover an expanded sense of self and purpose. In order to do so think about the things that you are drawn to do but feel are impractical like being an artist rather than an engineer, and see if you can discover ways to incorporate that aspect of yourself into your work or way of being in the world. You may find there is something just waiting for you to accomplish.